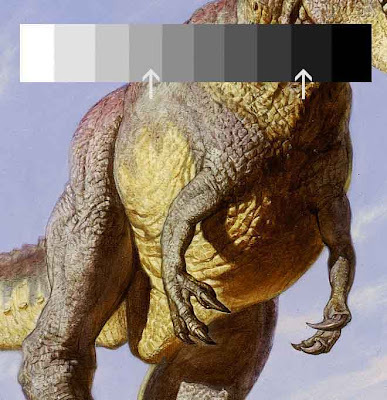 For the last few weeks, I’ve been doling out tips from the dino art workshop in the current issue of ImagineFX Magazine. Here are the final two that I'll share on the blog. If you want the whole workshop, you’ll have to grab the magazine. 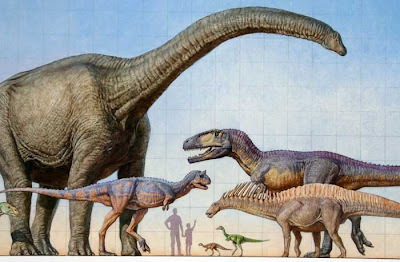 In scientific paintings of dinosaurs, you obviously can’t show humans for comparative size, but you can imply a human scale of reference. We’re accustomed to seeing photos taken from about a five foot standing height. If you set the viewpoint at five feet above the ground, you’ll give an implicit sense of how big the dinosaur really are. When I painted this diagram for a National Geographic story on Argentinian dinosaurs, I used two ghosted figures and a grid of meter squares to show relative scale. If you’re painting a dinosaur on a sunny day, don’t underestimate the separation in tone between the light side and the shadow side. It's almost always greater than you think. 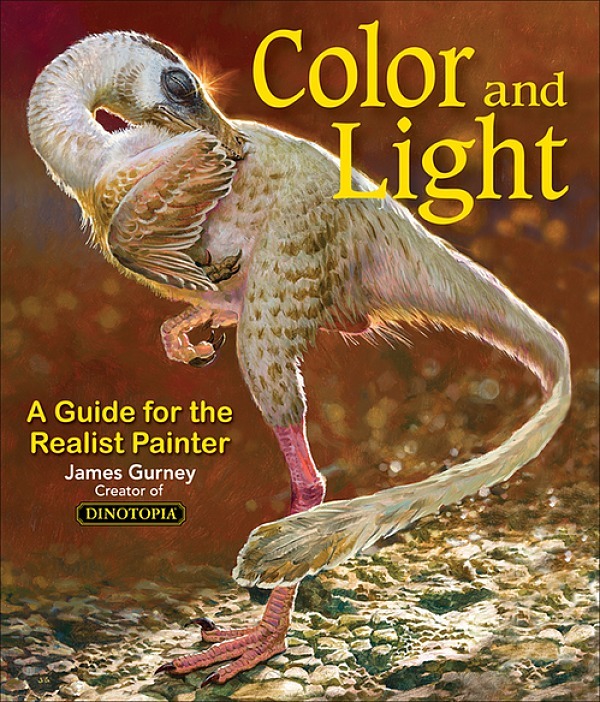 Understating the separation between light and shadow is one of the most common mistakes of paleoart. It happens when we’re not totally sure of the form, so we’re hesitant to commit to what’s in light and what’s in shadow. Maquettes are a big help to solve this problem. Photographers often measure the difference between light and shadow as at least two F-stops, depending on how much fill light is available. If you're counting steps on a value scale from one to ten, you might typically see five steps of tone from light to shadow. The separation between light and shadow would be less if you have high clouds, hazy atmosphere, or a lot of light bouncing up from a light-colored ground surface. More GJ posts on dinosaur maquettes, link; and fill light, link. Wonderful stuff, James-- Thanks for posting! I agree, a fantastic article. I picked up the issue straight away. I wasn't aware of ImagineFX until you mentioned it. I grabbed the Frazetta tribute issue as well. I was a amazed. 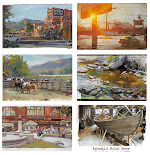 As a traditional oil painter slowly venturing into the digital tweaks and tricks, there was more useful information in each magazine than in some of my university studio courses. Thanks for your insightful tips, and inspiring work! I knew there was something tugging at me about the paintings you used in these posts, and even after reading that they were Argentine dinosaurs it didn't immediately click. I must need coffee. You see, I'm currently in Argentina studying for the semester, and these particular four dinosaurs are everywhere.